After 9 winning and 1 scratch trades, I finally gave some money back to the market. So now it’s time to stop for a moment to correct my Elliott wave counts. 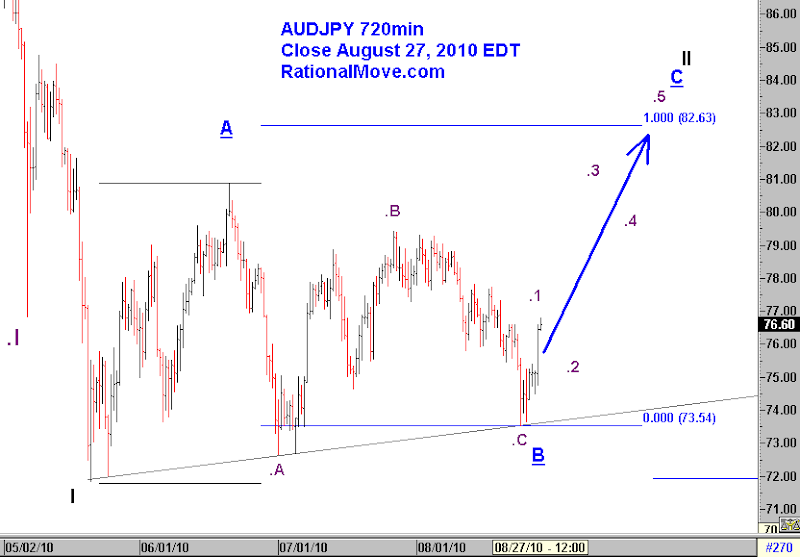 I posted my view on EURUSD yesterday, and I will take a look at AUDJPY today. First chart is monthly. I actually thought it’s more natural to count the July 2007 peak was the blue under lined III, instead of counting it as V. After III peak, complex w-x-y pattern follows to blue underlined IV, then the truncated top of V in August 2008. 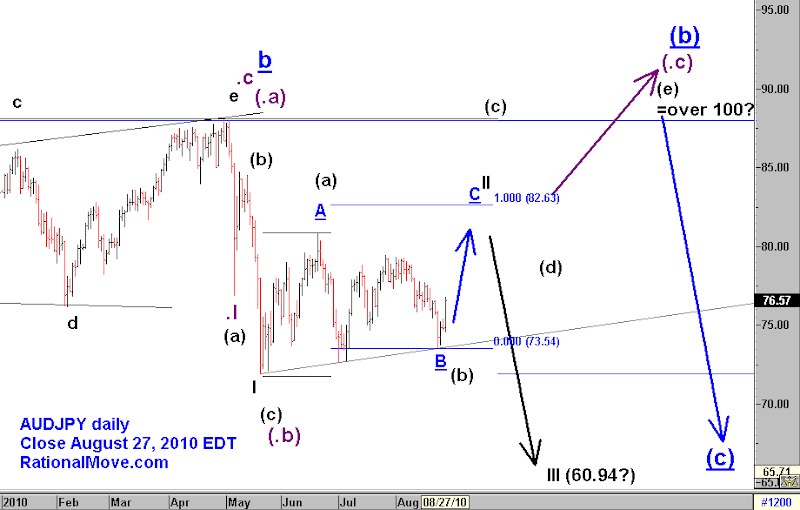 The great correction started from there as we can count purple .I to .V, .V being truncation again and it is concluding blue underlined a of a potential zigzag a-b-c pattern. If the AUDJPY is indeed following a zigzag correction pattern, we are either in or finished blue underlined b rally, and the following blue underlined c should be an impulse pattern that most likely will travel as far as blue underlined a did (4891 pips). 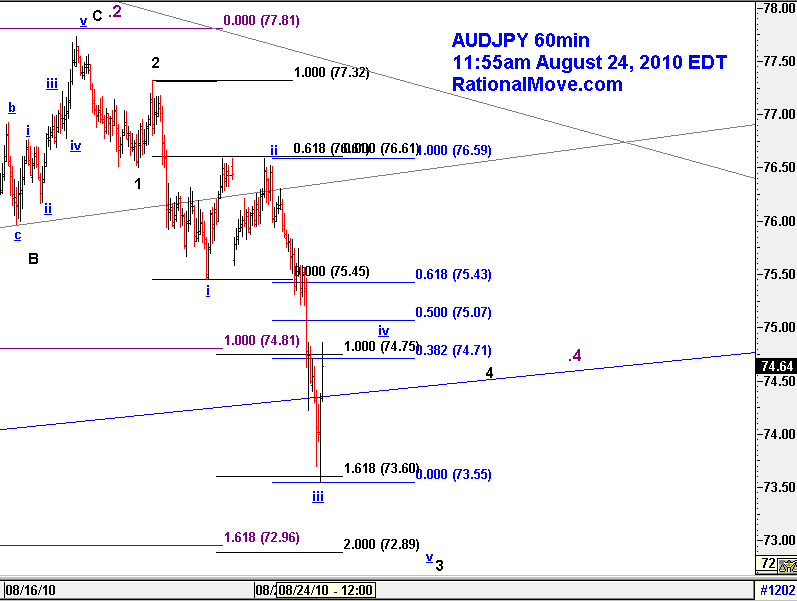 So the question is whether AUDJPY has already finished blue underlined b or not. This I don’t know yet. 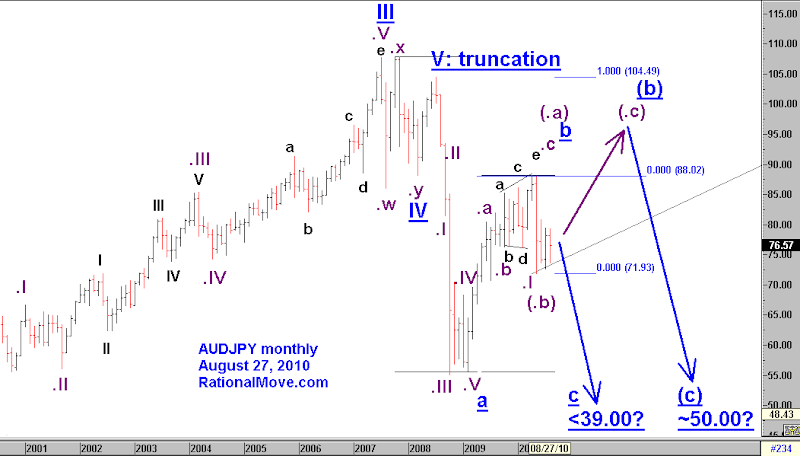 If AUDJPY has topped at 88.07 on April 30 and that is it (primary scenario as I labeled without parentheses on the chart), then 88.07 – 48.91 = 39.16 is the AUDJPY’s target when blue underlined c finishes. If AUDJPY has not finished blue underlined b and April 30 peak was just purple .a as I labeled with parentheses, May 20 low was the end of purple .b. AUDJPY should see a final rally along purple .c, probably going higher than April 30 peak. In this case, the starting point for blue underlined c wave will be much higher than the 1st scenario, so the bottom of the AUDJPY will be estimated somewhere around 50.00. The next chart is daily, and this is the interesting part. Again, the 1st scenario has labels without parentheses, and the second with parentheses. Although my view is split into two scenario in the mid term, the next move is up and impulse in both scenario! This is one of the reasons I like trading short term after checking where we are in the mid to long term. So, in either case, I am bullish for September. The reason I’m not trading EURUSD: Frankly, I don’t know where it’s going! 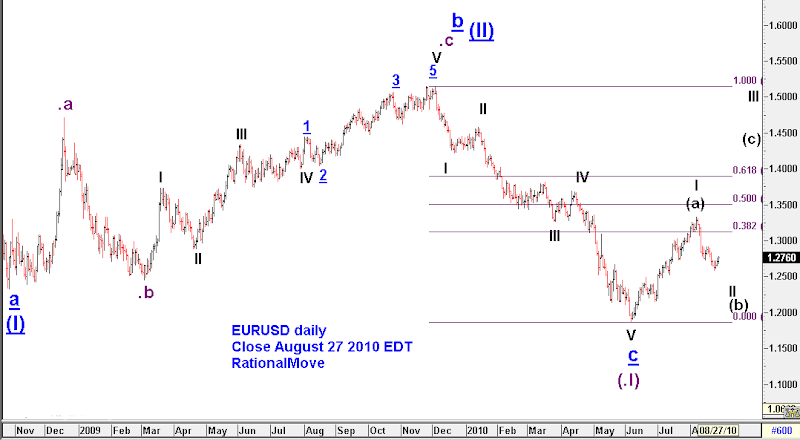 It’s been a while, so I opened EURUSD chart and counted Elliott wave from scratch. I could count two or three ways in the daily chart. Let’s call them Scenarios 1-a, 1-b, and 2. Scenarios 1-a and 2 are shown in the chart below (click to enlarge). Scenario 1-a is shown with the labels without parentheses. Since financial crisis, EURUSD traced a zigzag retracement (shown with blue underlined a-b-c). And yes, in this scenario, the correction is over and Euro will rally for the long term. Euro does not go below blue underlined c (1.1877), and the next target is around 1.45 to 1.52 (black III). Scenario 1-b is a minor tweak to 1-a. blue underlined c is not over. 1.1877 is the end of black III of blue underlined c instead, and the recent rebound to 1.3334 was the 1st leg of black IV wave. In this case, we would see EURUSD caught in the range of 1.4218 ~1.1877 for a few months, and it will go down for the final descent to the real blue underlined c (most likely below 1.1877 and probably above parity). Scenario 2 is catastrophic to Euro (labels with parentheses). What I thought blue underlined a in the Scenario 1 is actually the 1st wave (blue underlined 1) of a super historic move. After marking blue II marked at 1.5145, we saw the purple .I of blue underlined III that would go below parity (0.8229? ), and Euro will keep going down until it disappears from the Earth. So, for at the long term, I have very contradicting scenarios. But the good news is I’m a short term trader. Long term price movement holds short term price fluctuations, and at this high frequency moves, even contradicting long term scenarios may share the same move very often. If I find a short term movement that fits to all of these long term scenario, I will surely attempt to trade. And as the time passes, it will be obvious that I need to reject two of the three scenarios, and become more confident to one particular scenario. Then I can trade bigger. It turned out my original prediction was correct. But between my impatience and the power and water shutdown in Houston after the heavy thunderstorm, I existed from the good position prematurely. After the sharp downhill, AUDJPY look like gaining the first meaningful rebound. I think this is a clearer case of 4th wave correction before the final 5th wave descent (blue underlined iv to v in the chart). So I decided to offer at 38.2% rebound (74.71) and it filed before I finish writing this article. In Elliott wave principle, 4th wave of an impulse wave must not enter the territory of 1st wave (it would be deemed non-impulse otherwise), so my stop loss is at 75.55 just above the blue underlined i. I target 73.00 to 72.90 as the profit taking level. I am risking only 0.66% of my capital for this minor trade.